frank zappa was a guest in the steve allen tv show in the early sixties. 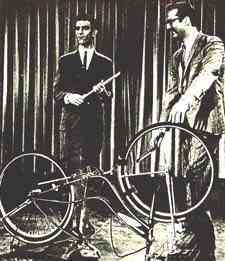 together with host steve allen, zappa played a bicycle. video footage exists. for someone of steve allen's versatility and staggering capacity for work, jazz occupies a small yet significant portion of his biography. yet despite his crowded agenda, allen can still spin out facile, competent, bop-and-cocktail-flavored piano in fast jazz company - nothing particularly original but always pleasurable to hear. he started to play the piano while a child - his parents were traveling vaudeville performers - but the keyboard soon had to take a backseat to his media career, first on radio and then on television. best-known as a comedian and the first host of the american tv institution, the tonight show 1954-57), allen frequently played piano and sang on his shows and used them as a forum to present guests from the jazz world. he also played the lead role in the film the benny goodman story in 1955, produced the tv series jazz scene usa in 1962, and narrated a history of jazz on records the jazz story coral). allen recorded frequently for coral, dot, roulette, emarcy, and decca during the peak of his tv fame and as late as 1992, taped an enjoyable mainstream set for concord jazz, plays jazz tonight..
steve allen, the zany comedian and witty social commentator whose career zipped at warp speed from one occupation to the next--from hosting the original tonight show to lecturing about morality to composing thousands of songs--died monday night at the home of his son, bill, in encino. he was 78.
allen had been playing with four of his 11 grandchildren when he lost consciousness and later died of an apparent heart attack, said his publicist, warren cowan associates. the son of vaudeville actors, allen charmed radio and television audiences for decades with his inspired schtick, most of it ad-libbed. as host of the tonight show in the mid-1950s, allen invented the genre of late-night tv and redefined the art of comedy, serving up screwball skits like the question man and the very emotional reading aloud of letters to the editor. "my comedy has always appealed to the hip and to the silly, whether it's the nine-year-olds who dig the silliness, or the high-school and college kids who dig the hipness," he once said. but allen was equally comfortable with more serious material. he created meeting of the minds, an award-winning educational television show, in 1977 to present imaginary debates between historical figures such as charles darwin, attila the hun and marie antoinette. allen also made a determined effort to introduce his viewers to jazz greats, showcasing soloists with the tonight show band and interviewing legendary musicians for a television program called "jazz scene u.s.a."
allen's versatility astounded his many admirers. he dove into nine feet of jell-o on the tonight show, and also penned a weighty book on religious cults. he composed the song "this could be the start of something big," and also published a murder mystery, a musical and three books of poetry. he pioneered the concept of taking a hand-held microphone into the audience, and also analyzed migrant farm workers in the 1966 book "the ground is our table." allen, who called himself a musical illiterate, gives an interview in his office in van nuys in 1996.
from religious communes to nuclear weapons, from chinese culture to body-toning gimmicks, allen's interests spanned the globe. he took pride in his expansive imagination: "i never repeat a routine," he told the chicago sun-times in 1995. "i'm the only comic in the business without an act. i've been doing this for 50 years and never had one." the man hailed as "hey, ho, steverino" was born the day after christmas in 1921 with a mouthful of a name: stephen valentine patrick william allen. his father died when he was a toddler, and his mother took to the road with a comedy routine, often leaving young steve in the care of her family, the donohues. allen has traced his comic gift to his childhood with the donohues, who bantered constantly-- sometimes sarcastically, sometimes disparagingly, but always humorously. growing up amid laughter, allen found comedy came to him as naturally as coughing. "the reason i don't have ego problems is that i'm clear about one thing," allen told the boston globe in 1989. "my gifts are in the same category as the color of my eyes: genetic. it's just a roll of the dice." allen launched his career in 1942, when he dropped out of college after desultory studies at drake university in iowa and the arizona state teachers college. he picked up a job at radio station koy in pheonix, producing his own show and launching his first comedy act. drafted during world war ii, allen was released from the army after just a few months due to disabling bouts with asthma. in his 1960 autobiography "mark it and strike it," allen described himself as "a pampered, sickly bean-pole, too weak for athletics and too asthmatic for the army." instead, he found his niche performing. allen moved west for a job with hollywood radio station knx in 1948 and developed his now-famous routine of dabbling with the piano keys, chatting with his audience, commenting on his mail and improvising hijinks. after just two years, allen transferred his radio act to television with the steve allen show, which debuted on christmas day 1950.
but allen's greatest biggest success came three years later, when he signed up to host the tonight show from 11:30 p.m. to 1 a.m., live from new york city. with his madcap antics and free-swinging experimentation, allen turned the tonight show into a riotous, and wholly unpredictable, program. comedian george carlin described allen's verbal fireworks as "crashing, cascading brilliance [with] an instinct for the jugular." allen remembered the tonight years more modestly: "it was tremendous fun." jayne meadows lent her name to two of allen's companies-- meadowlane music, which published thousands of his songs, and meadowlane enterprises, which produced his television shows, nightclub acts and the odd drama. meadows inspired allen throughout his career, helping him achieve his ever-expanding goals and encouraging him to try new fields. "i've always been a compulsive reader," he once said, "but after marrying jayne, i started reading different things." he also started writing different things. first, a collection of satirical short stories ("the girls on the tenth floor," 1958), then a pamphlet on international politics ("morality and nuclear war," 1961). he wrote a rather rambling novel ("not all your laughter, not all your tears," 1963), a report on the nation's laspe into immorality ("corruption in america," 1979) and a documentary of his two visits to asia ("explaining china," 1980). an irascible activist, allen spoke out loudly against capital punishment and nuclear proliferation. he bemoaned the lapse of what today would be called "family values," but allen was hardly a conservative. his concern for society's underdogs led him to consder running for either the u.s. congress or the california legislature as a democrat in the early 1960s. instead, he chose to zing the public consciousness in writing, churning out "dialogues in americanism" and "letter to a conservative" in hopes of stimulating political debate. as he blew past age 65, allen gave no thought to retiring. he had made millions from histelevision shows, his commercials for mocha mix and restonic matresses, royalties on his songs, and his lectures across the country. but still, he continued to write, speak, act, compose and perform with several symphonies a year. he always walked around with at least one tape recorder at his side, careful to capture his ideas before they slipped away. and he generated--and read--huge stacks of paper. "i think it would be appropriate after i die," he told the new york times, "if they just shovel 8,000 pounds of paper on top of me instead of dirt." in the 1990s, allen turned his biting wit to a long-standing concern: the dumbing-down of america. he coined a term, "dumbth," to express his view of most americans as slow-witted, gullible and bumbling. "the american people are dumber now than they have been in a long time," he explained. although he sprinkled his observations with humor, allen was dead serious about dumbth, alarmed that americans seemed oblivious about world events, ignorant of history and clueless about geography. things were different when he was a boy growing up in the midwest, he said. "there was nobody in my group of 10 year-olds who didn't know where canada was." television, too, incurred his wrath. as early as 1980, allen told the washington post that tv comedies were "far too dirty for my taste. a lot of the younger comics are deliberately going for the ain't-we- naughty kind of stuff." later, he mourned, "what we used to consider shame [now] tends to make you a celebrity." yet another of allen's preoccupations was religion. he wrote the book "beloved son: a story of the jesus cults" after his son brian joined the love family commune. and while he pilloried most religious beliefs as stupid, he raised money for the unitarian church, the salvation army and other religious groups. he saw no contradiction in helping churches even as he belittled their ideology. "if someone were to invent a religion tomorrow in which, if you want to contact god, all you have to do is buy a pumpkin, everyone at first would scoff at the stupid person who believes that somehow pumpkins are physically part of god," he told the times in 1992. "but now, chapter 2: these people open kitchens, buy clothing and build shelters for the homeless. i think their views about pumpkins are dumb, but they are helping starving, miserable people and i admire them, and i will help them." in his later years, allen tooled around southern california in an aquamarine rolls royce. he marked his favorite parking space with a typically brash warning: "don't even think about parking here." and he filled his van nuys office and encino home with stacks of black notebooks containing newspaper stories and other tidbits of information organized by topic, from aids to congress, economics to politics, religion to "funny men." allen continued to seek new venues for performing throughout his life. he put out a compact disc, "steve allen plays jazz tonight," in 1995. during his publicity tour, he acknolwledged that he had never learned to read music. but he heard notes constantly, he told the chicago sun-times, describing the sensation as "this magic radio in my head." in putting together a retrospective of allen's broadcast career, david bushman, the curator of the museum of television and radio, described his subject as "a man with two sides: the serious man trapped in a vaudevillian's body." allen seemed to take delight in both of his personalities--the acerbic social commentator and the loony, daring comedian. as for his frenetic pace, he laughingly called it a genetic secret. "i never planned it," he said. "all i can say is what popeye says: 'i am what i am.' "
also please refer to the steve allen show entry in the videography faq. 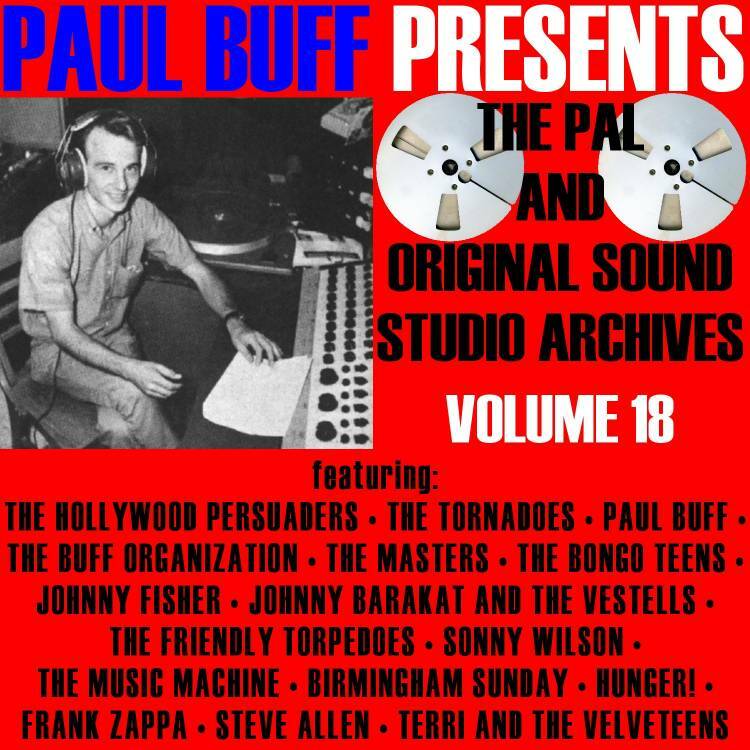 "Closing out this volume is Frank Zappa's appearance on Steve Allen's television show in March 1963. This master was transferred from the original film, so it is the best quality presentation of this track that has ever been released." "Our first volume had the complete Frank Zappa interview with Steve Allen and their joint performance of his "Cyclophony" on his sister Candy's bicycle. 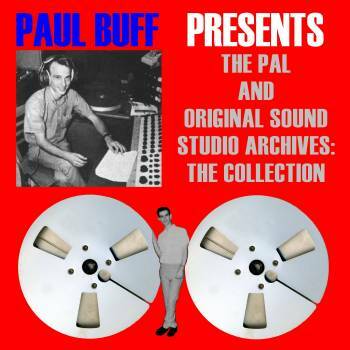 If you just want to hear the live performance with studio extracts created at Pal, here it is!"